My hair is softer and shiny with this product. the chlorine in the water here is very harsh without the filter. Reliable company and easy to contact. This products does the job and is easy to install. Excellent service. Replacement cartridge. Already feeling the benefits. 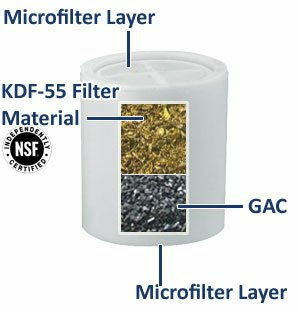 I have found the filter very effective as I have problems with the amount of chlorine in the local water supply. brilliant, easy to fit and works really well. Brilliant product. We have both noticed the difference after installing the shower filter. Skin feels softer and less hair conditioner required. Seem to work well, cartridges life is long as well. I find the shower filter perfect for my needs. I have used shower filters since I moved to Berwick because I discovered I had a severe reaction to the chlorine in the water. I did call the water board and was told that the amount of chlorine in the water was within government regulations and I was unlucky, but if I put lemon juice in the water when I wash it would neutralise the chlorine. I have to buy bottled water too. been using your shower filters for 5 years now for all family (incl paragon shower heads). very happy with the product results, durability and prompt delivery service. thank you. Very good service .easy to use Web site . Definitely works as specified but my wife has such a sensitivity to chlorine that it is effective for a month at the most. I have a problem with tap water as it is loaded with chloride. The water board advised me to put lemon juice in the bath to neutralise the chlorine, but there isn't always time for a bath. With the filter I can now have a quick shower . I have used the filters for some years and they appear to work very well . Web site/ordering is good , however no instructions are ever sent, so remember which way round replacements go back in. plus no spare seals are enclosed . After time they deteriorate and leak as they would. I was able to improvise but others may have to buy a new holder? ** Reply from PS Team ** Thank you for your review. We are always happy to supply customers with parts when old parts get worn out. Just like we have already sent you parts for your shower filter free of charge. I am quite happy with the filter, not sure if it filters all the impurities in such a high amounts listed on the accual web page, but definetly the water is much better with this filter. I am returning custumer. does what it says on the box i.e. filters shower water,and it gives peace of mind as I found residue in the cold water supply which had blocked the stop tap in my new house prior to fitting the filter.